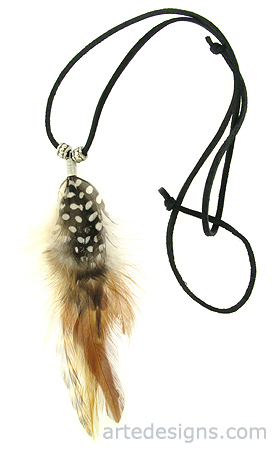 This feather necklace consist of naturally striped and spotted feathers that are full of texture, depth, and fluff. Feathers may have darker or lighter stripes. Approximately 5.5 - 6 inches long. Feather necklaces are available with tarnish resistant silver or gold plated wire. Choose a 20 inch brown or black suede cord that ties in the back or an adjustable 16-18 inch sterling silver chain.